All transactions are safe and secure with a reliable history in online purchasing behind each of our associates. 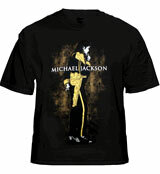 Buy the Michael Jackson Stand t-shirt to own Michael Jackson clothing and merchandise. Wear this dark tee underneath one of the Michael Jackson costumes displayed in our gallery. The design on the front shows MJ standing as he contemplates his next dance move. Few performers can match his wide range of abilities. Surpassing the showmanship of Fred Astaire and Charlie Chaplin, two of his idols, Michael Jackson was a dancer, singer, choreographer, author and songwriter. Wear it with a Michael Jackson glove. In addition to the Michael Jackson Stand tee above, browse the Michael Jackson Clothing Gallery for more apparel like men's and women's clothes, kids shirts or hoodies.